Potato is an important crop in the United States and rates fourth among world crops in terms of production. There are over 2700 potato fields in Northeast United States and potato growers often over apply nitrogen fertilizer to ensure against loss of yield. High mobility of nitrate in the soil profile makes it susceptible to leach to the lower soil levels leading to ground water nitrate contamination and environmental concerns. Regardless of costs of fertilizers, nitrate contaminated water causes serious illness for infants and pregnant woman which could not be tolerated by public. Selecting appropriate type of cover crops as nitrogen scavengers along with supplementary nitrogen management can reduce nitrate leaching and water contamination. Traditionally, farmers plant rye or oat in Massachusetts which might not meet nitrogen requirements of succeeding potatoes. The objectives of this study were to 1) Evaluate influence of different cover crop mixtures on minimizing nitrate leachate caused by surplus nitrogen fertilizer application 2) Asses cover crops’ decomposition rate and its synchronization with potato nutrient demands 3) Study nutrient density and tuber yield of potatoes as affected by cover crop mixtures and nitrogen fertilizer. The student will measure nitrate leaching, cover crop decomposition rate, tuber yield and nutrient density of potatoes, and nitrogen use efficiency. The research data obtained from this project will form a basis for recommendations for potato growers in Massachusetts to alleviate nitrate leaching by proper cover crop and nitrogen fertilizer management. Evaluate efficiency of cover crop mixtures in nitrate leaching reduction in a potato production system. 2. Assess decomposition rate of cover crop mixtures and determine nitrogen mineralization synchronization between cover crops decomposition and potato’s growth. 3. Evaluate yield and nutrient density of potatoes as affected by nitrogen fertilizer and cover crops. This project contains two major phases during 2013-2015 growing seasons. The first phase includes land preparation and planting cover crops in fall 2013 and 2014. The second phase includes planting potatoes in the spring of 2014 and 2015. While the first year of the experiment is accomplished, the second year is ongoing. Experimental plots were disked and prepared for cover crops in mid August 2013. Before planting cover crops, soil samples were collected from the experimental plots to test the nutritional background of the soil and fertilizer was applied where deemed necessary. Before planting the cover crops, nitrate absorbent capsules/collectors were prepared and buried in the soil to monitoring nitrate leaching during cover crop growing period. We used a nitrate absorbent resin with high anion exchange capacity, tightly packed with mesh bags to prevent mixing soil particles with resin. Each collector consisted of cylinder shaped containers with a fine mesh at the bottom and at the top of the containers. Nitrate collectors allowed easy percolation of water through the capsule while prevented soil of being mixed with resins. Each capsule contained 100 g of nitrate absorbent resin and buried below cover crop root zone. Therefore, the capsules were buried at different soil depth depending on the cover crop species. Cover crop seeds were weighted separately according to each species’ planting density and mixed in small bags for easier application. Afterwards, five cover crop seed mixtures including forage radish/oat, forage radish/peas, forage radish/rye, peas/rye, and peas/oat were planted in the field with a grain drill planter on August 25 in 2013. I addition, a no cover crop plot was considered to compare cover crop treatments with no cover crop ones. Cover crop tissue samples were taken from cover crop stands at different growth stages before frost. Also, soil samples were taken three times during the growth form three different soil depths (20, 40, and 60 cm) and before soil frost. Mixed cover crop tissue samples were weighted, prepared and placed in the plastic mesh bags for the decomposition rate experiment. Two groups of samples were placed in a plot next to the main cover crop plots. A group of samples were buried under the soil while another group was fixed on the soil surface to compare decomposition rate of the samples in tilled- and no till systems. Also, soil temperature sensors were installed to monitor soil temperature changes during the experiment. Among cover crops, forage radish, oat, and peas will be winter killed while rye can survive the winter and continue its growth in the spring. Nitrate collector capsules were sampled at equal intervals during the growing season and before the cover crop termination. Resins were then extracted from the capsules and rinsed with distilled water. Afterwards, the resins were put into Erlenmeyer flasks mixed with 3 M KCl and shaken on a reciprocal shaker for one hour. The samples were then diluted and analyzed colorimetrically with the vanadium chloride method. Tissues samples were analyzed in distinct intervals to evaluate nutrient and weigh loss of samples when the temperature reached 45o F in the spring. After the first phase of the experiment in fall and winter 2013, experimental plots were disked and prepared for planting potatoes. Potatoes were planted late April using a small potato planter. The distance between rows was considered 36 inches while the distance between plants on the rows was considered 9 inches. Four levels of nitrogen fertilizer including no application of nitrogen (N0), 50 kg N ha-1 (N1), 100 kg N ha-1 (N2), and 150 kg N ha-1 (N3) supplied as urea (46% nitrogen). Since half of the applied nitrogen fertilizer could be lost through leaching, de-nitrification, and volatilization, we banded urea in the plots. During the growth and development of potatoes, plant tissue samples were taken at 4 growth stages including: vegetable growth, tuber initiation, tuber bulking, and tuber maturation. Potatoes were harvested late August and after weighing tubers in each plot, sub-samples were taken to determine nutrient density of tubers. Tubers were washed and rinsed with distilled water, cut and dried in the oven for 72 hours. Afterwards, dried samples were weighed again and ground using a Willey Mill and then passed through a 1-mm mesh screen. To turn ground samples into ash, 0.500 g of ground samples were weighed and put in crucibles and heated in a furnace at 500o C over night. The ashed samples were then acidified with 25 mL of 10% HCl, filtered and stored in plastic bottles to measure the concentration of nutrients in each treatment. Another set of ground samples were weighed (0.250 g) and acidified with 3.5 mL of sulfuric acid, heated for 1 hour (according to the Kjeldahl procedure), diluted with 46 mL of distilled water, and stored in culture tubes to measure the total nitrogen using a Lachat Quickchem machine. Cover crop mixtures showed a significant difference compared with no cover crop plots in terms of potato tuber yield. No cover crop plots produced lower tuber yield than potatoes planted after cover crops. While the highest level of nitrogen fertilizer increased tuber yield in no cover crop plots, mixtures produced higher tuber yield at lower nitrogen rates (Figure 1). The highest tuber yield was obtained from oat/forage radish (25.8 Mg ha-1) and oat/peas (26.1 Mg ha-1) mixtures, fertilized at 100 kg N ha-1 (Figure 1). Application of 150 kg N ha-1 decreased yield in oat/forage radish and oat/peas plots compared to 100 kg N ha-1. Oat/Forage radish mixture showed to be more efficient in providing nutrients for the following potatoes when no nitrogen fertilizer was applied (Figure 1). Our results confirmed those reported earlier by Vos and Van der Putten (2004) who found increased potato tuber yield when potatoes were planted after cover crops. Peas/forage radish mixtures produced the highest biomass and dry matter (4.13 Mg ha-1) among mixtures and the lowest dry matter yield was obtained from oat/forage radish (Figure 2). Similar to the dry matter yield, peas/forage radish mixture had the highest nitrogen yield (195 kg ha-1) followed by oat/peas (181 kg N ha-1) (Figure 2). Cover crops have been introduced as an effective way of decreasing nitrogen leaching into the soil and decreasing nitrogen fertilization. Our results showed that cover crop mixtures reduced the amount of nitrate leached into the lower levels of the soil compared with no cover crop plots (Figure 3). The highest amount of nitrate leachate was observed from no cover crop plots followed by peas/forage radish mixtures (Figure 3). Nitrate leaching was minimum in rye/forage radish mixture compared with the other mixtures and there was not a significant difference between rye/peas and oat/peas mixtures. Meisinger and Delgado (2002) have also reported reduced nitrate leaching in soil by adding cover crops into a rotation. 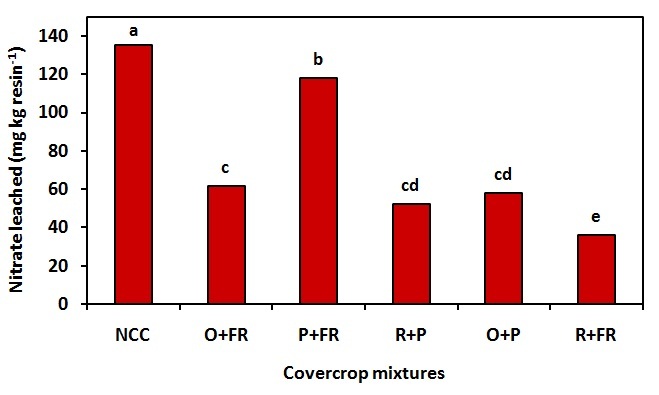 To assess the impact of cover crop mixtures on nitrate leaching prevention and also determine the synchronization between cover crop nutrient release and potato growth rate, it is also necessary to analyze the cover crops, soil, and resin samples in the second year of the experiment. Since only 1/2 of the experiment is completed, the data of the second year of the study could provide a more accurate interpretation of the results. Obviously, the final results of this project will increase our understanding of the efficiency of cover crops mixtures in a potato production system and could recommend a more compatible cover crop mixture to increase the tuber yield and quality of potatoes, decrease nitrogen fertilization, and ultimately, help to maintain environment sustainability. 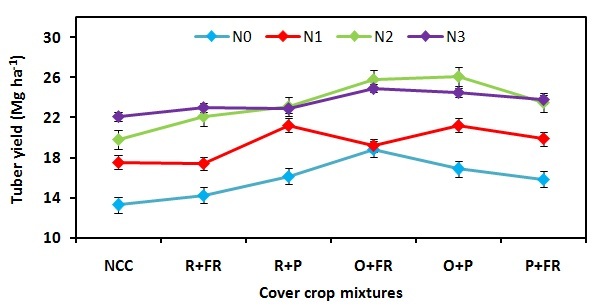 Fig 1.Effect of nitrogen fertilization and cover crop mixtures on potato tuber yield. N0, N1, N2, and N3 represent 0, 50, 100, and 150 kg N ha-1. Fig. 2. 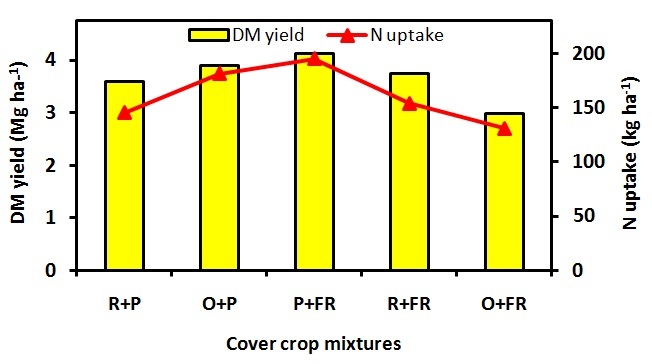 Dry matter yield and nitrogen uptake at different cover crop mixtures. Fig. 3. Nitrate leaching as affected by cover crop mixtures.